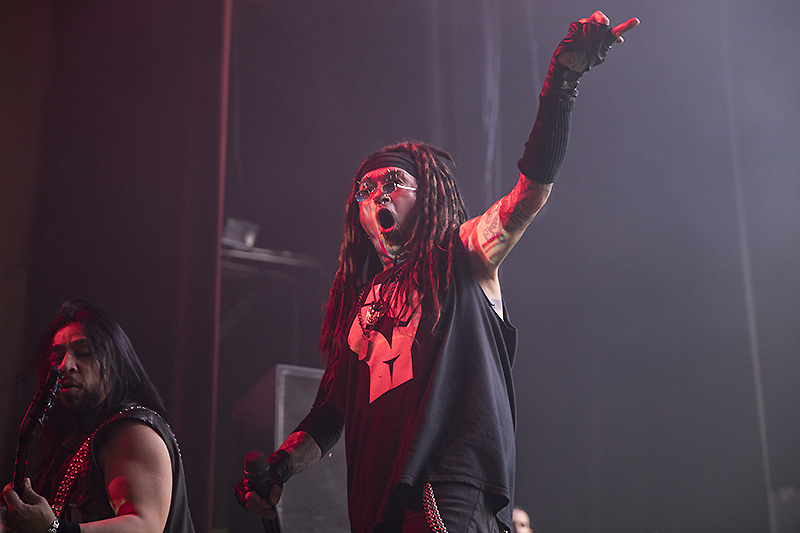 It’s been a long and winding road for Industrial metal visionaries Ministry and their mercurial front man and founder Al Jourgensen. 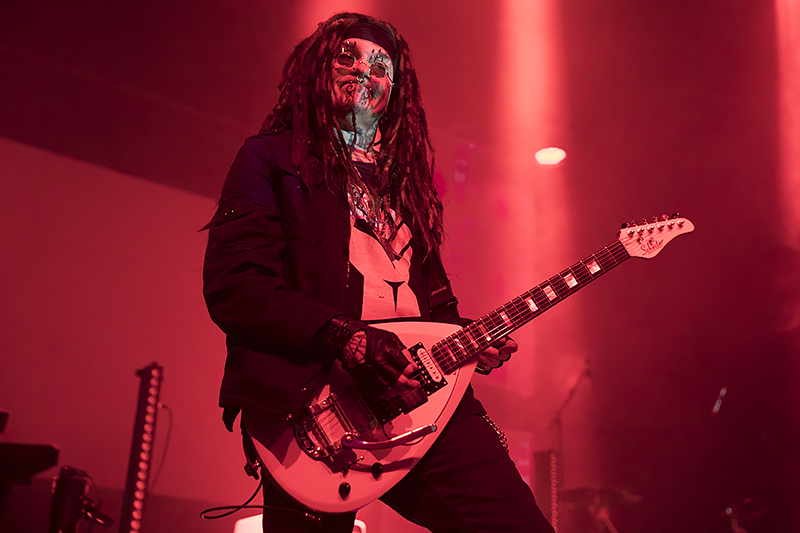 From the early beginnings in 1981, emerging from the Chicago underground club scene, to 2018 with the politically charged release of AmeriKKKant, Ministry has continuously led the charge for alternative and industrial music. 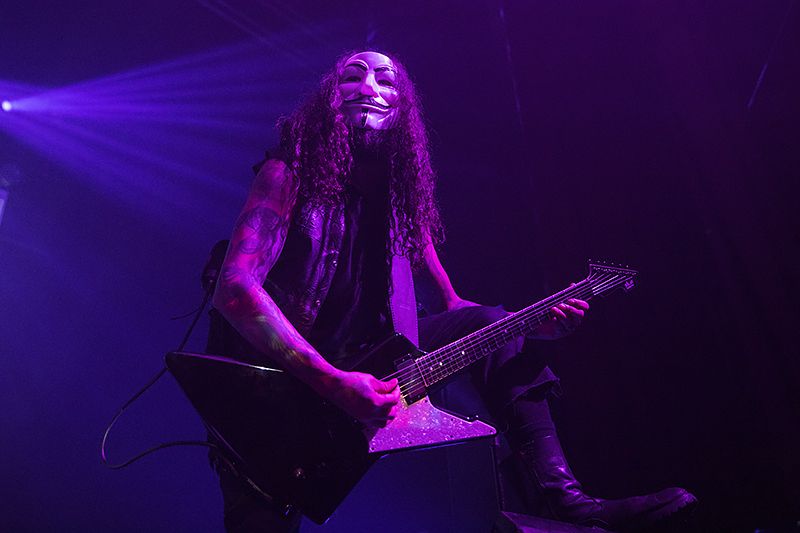 That charge stormed through San Francisco’s Warfield Theater to remind us of where Ministry has come from and to shine a bright light on where they are going. 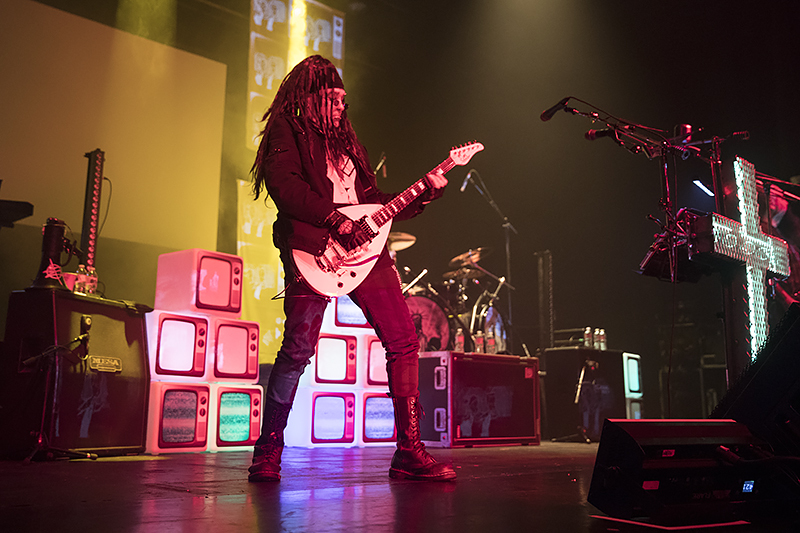 For both tenses, Jourgensen and Ministry seem intent on uncovering the ugly underbelly of American politics, calling out the institutions that seem bent on diversionary tactics to further their megalomaniacal agenda. 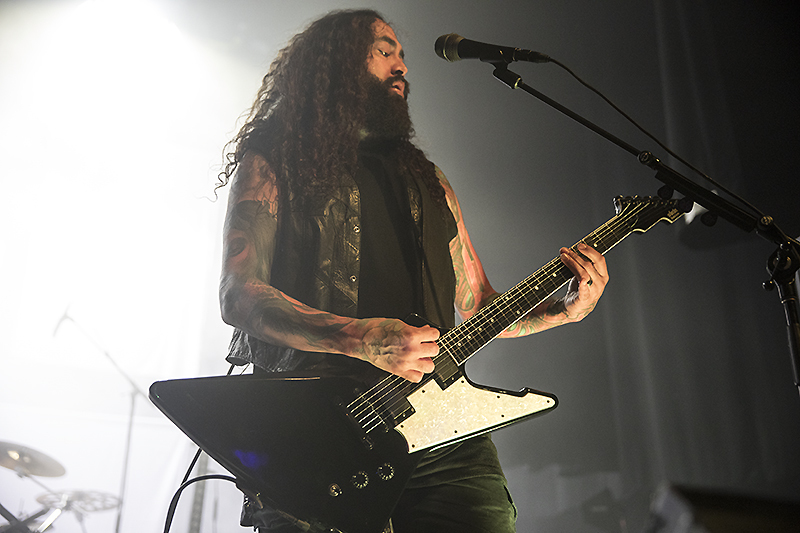 While you can’t always judge a book by its cover, within the first minutes of the Ministry show (‘I Know Words’ into ‘Twilight Zone’), it was apparent what the band had in store. Lyrically it would be a growling, brutally scathing evisceration of the United States political system. Musically it would be a high volume aural assault of grinding guitars, buzzing synthesizers, and dizzying samples staggering over the top of an undercurrent of booming percussion. From the onset Uncle Al was in prime form. Coaxing his brethren into chaos, the GA floor came alive like a scene out of Mad Max Thunderdome. 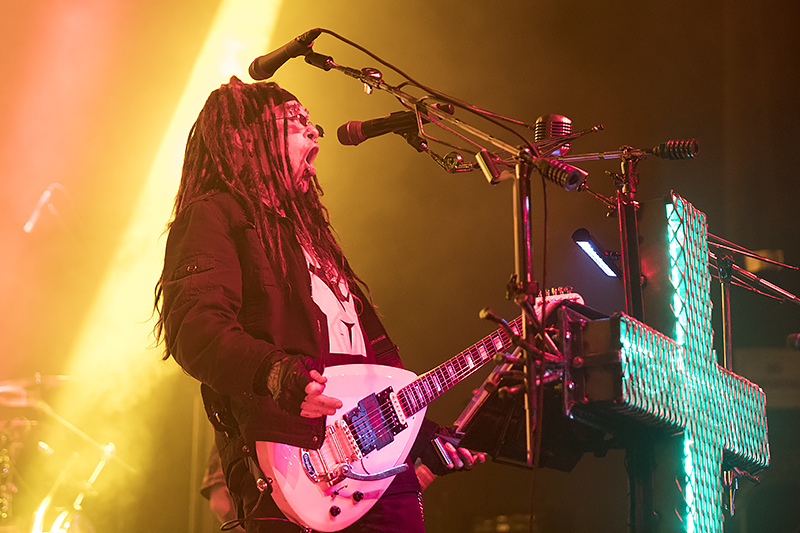 Stalking and snarling, wailing on harp and squealing on guitar, Jourgensen led his cronies through a fiery 90 minutes of current and past Ministry. The first half of the show was dedicated to new millennium Ministry. 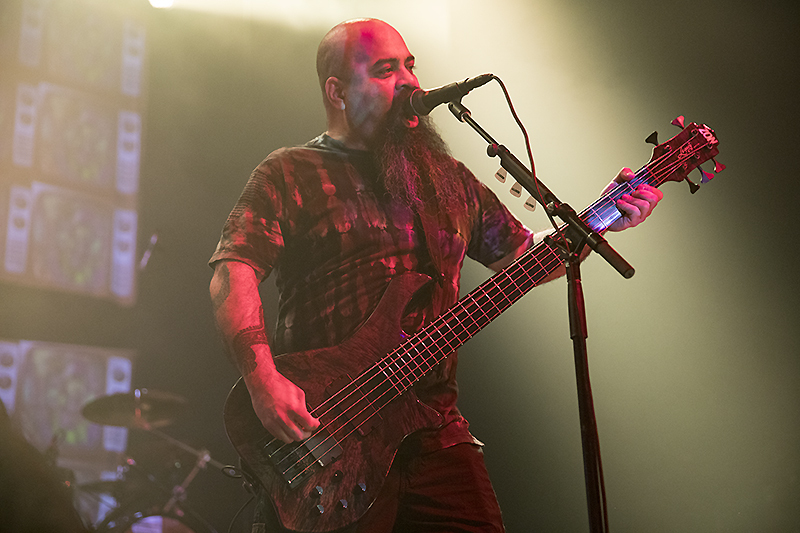 The band satiated the masses by binging and purging off of a menu of jagged industrial metal, highlighting cuts form the recent AmeriKKKant recording such as the blistering ‘Victims of a Clown’ and the uber-political abrasiveness of ‘Antifa’. 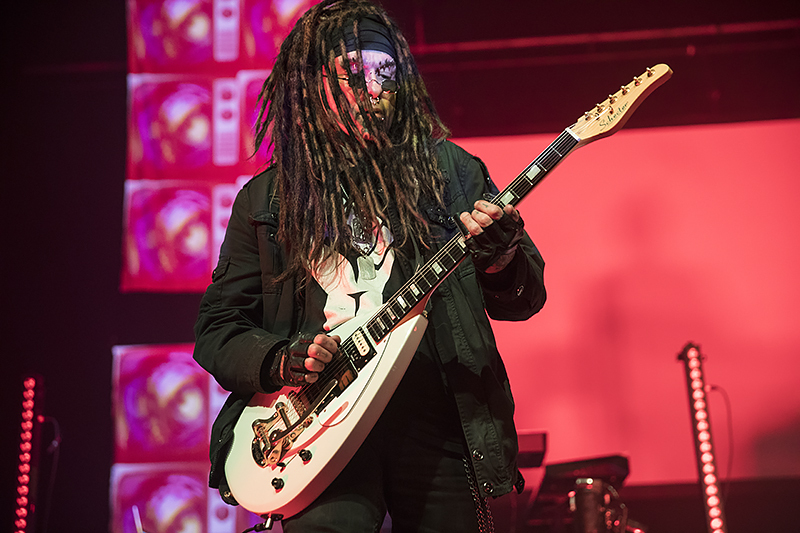 The back half of the set was a trip through a time machine to a pre-9/11 version of Ministry, leaner but still mean, with Jourgensen and crew driving home an apocalyptic musical prosecution of corrupt government lies and complacency. The main difference between new versus old Ministry is that the early stuff is more rooted in the club scene and thus has a more danceable element to the mix of aggression. Beginning the trek back through time by stirring the cauldron with ‘Just One Fix,’ the floor transformed into a giant undulation of bodies. 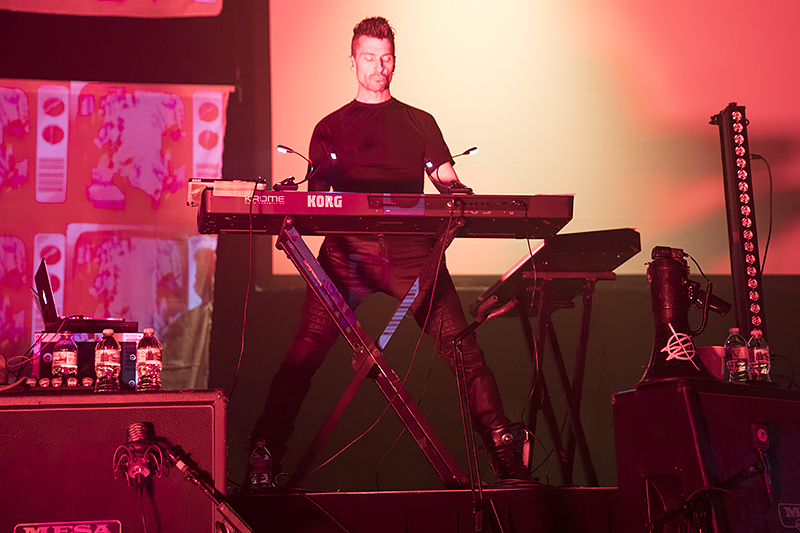 Whether by mosh, grind, or the one hooded guy who found enough floor space to do the worm, the ‘way back machine’ portion of the show sparked an energy that was obviously pining to be released. ‘N.W.O.’ was next to enter the asylum, and the lunatic Ministry fans took the cue to get crazy. With the flashing lights and swirling ring of bodies, it was a flash back to the old Terminator night club (for those of you old enough and blessed to know those glorious SF days). The sounds of the ‘good ole days’ hit a high with ‘So What’ (another old SF club…hmm get the sense Ministry had some influence on SF clubs in the 90s? ), and by the time Ministry shut it down with ‘Psalm 69’ and ‘Bad Blood,’ fans were released into the SF night as a sweaty, frazzled mess. 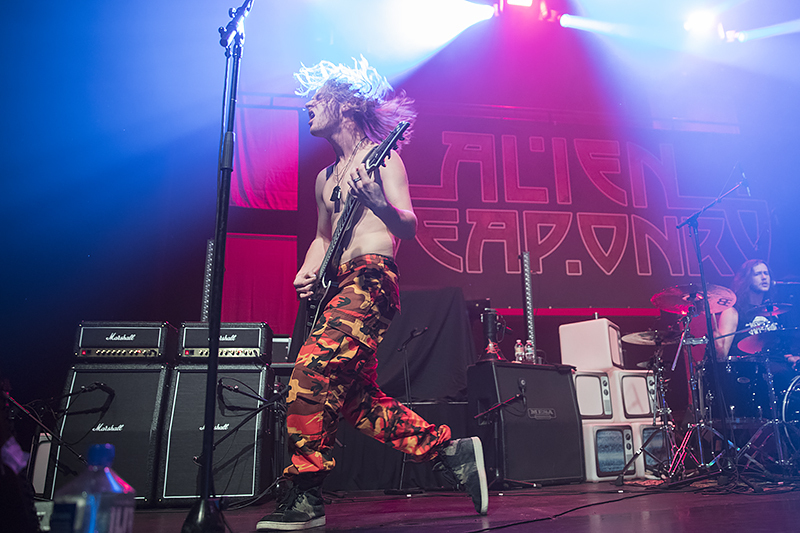 Taking the stage ahead of Ministry was a refreshing new twist on thrash metal in the form of Kiwi band Alien Weaponry. Formed in 2010 by the DeJong brothers Lewis (guitars/vox) and Henry (drums), and rounded out by bassist Ethan Trembath, this is a tribal, face-stomp of political thrash from a trio who are all 18 years old or less. In fact Lewis (who is a pretty good Jeff Spicoli ringer) and Trembath are both only 16. All three are unpretentious in fashion, looking like they just stepped off of a beach somewhere in New Zealand. 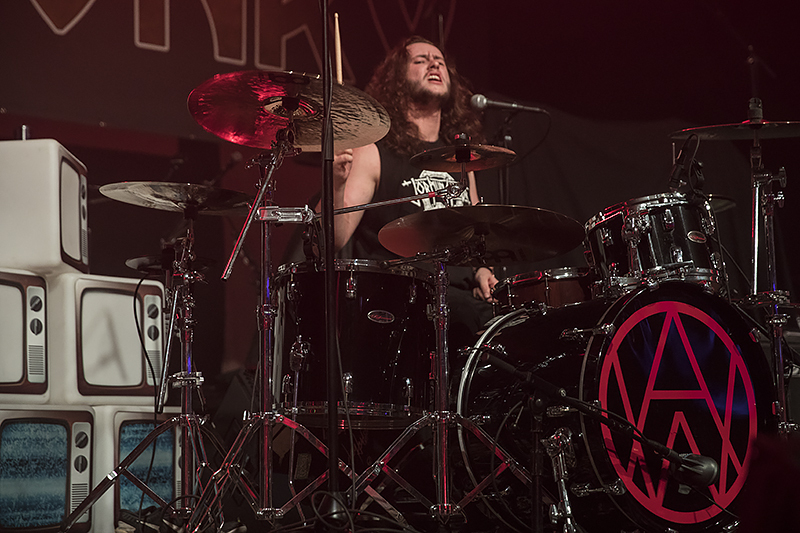 Sporting long hair and no tattoos, they also brought back a 90s staple in thrash – ripped shirts or shirtless stage presence and an unbridled energy that is as in your face as their music is heavy. Although they are new thrash, their musical style is rooted in the influence of some of the best thrash bands that put down the blueprint. You can hear the influences of Sacred Reich, Sepultura, and Pantera….a monstrous wall of violent guitar tone surfing on crushing, native-island percussive beats. Lyrically they are very politically inclined which is probably why they are on this tour with Ministry. In fact, many of their songs have to do with the injustices experienced by the indigenous Maori people of New Zealand. Brutally gripping songs such as ‘Raupatu,’ ‘Kai tangata,’ and ‘Rū ana te whenua’ are predominantly sung in the Maori language which is often chanted and adds to the warlike feel of their music. Watch out for these youngsters in the coming years as they will be causing a commotion for decades to come. For more information about Ministry, see their website. 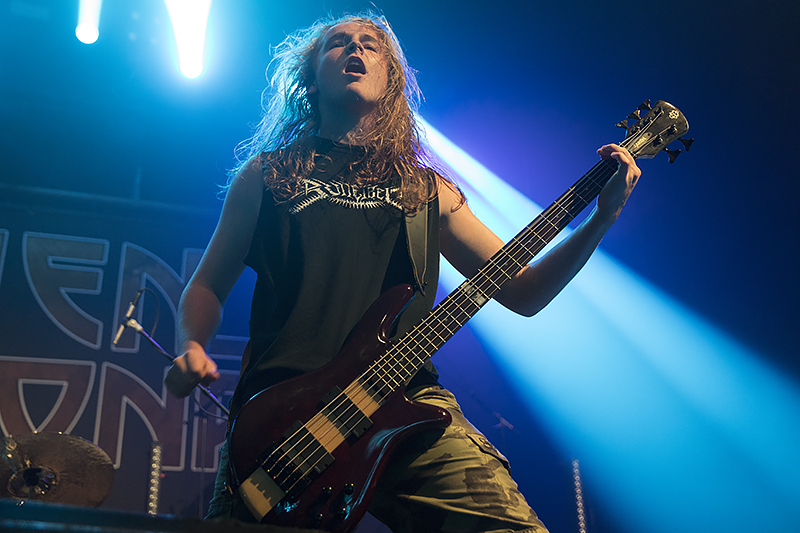 Find out more about Alien Weaponry here.